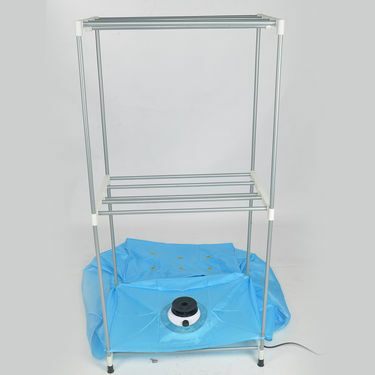 Electric Clothes Dryer suitable for damp, cold, rainy weather, to help you dry and disinfect your clothes and a variety of textiles. It can hang clothes hanging in the rack, so that your clothes will not wrinkle, the equivalent of Steam iron. 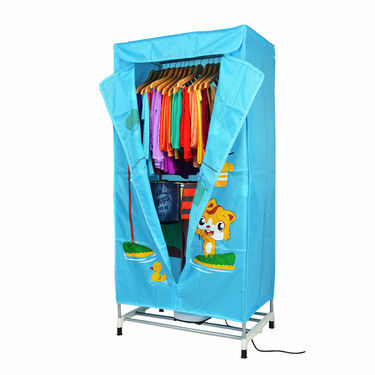 When you do not use, you can also use as a portable wardrobe, wardrobe. And the host of the dryer, you can also use as a heater, so you no longer cold. Very practical and effective. Electric clothes dryer is divided into upper and lower layers, you can hang more clothes. Not only have a lower rod hanging, you can hang clothes, there are two towel rack, you can hang towels, socks and other kinds of textiles. 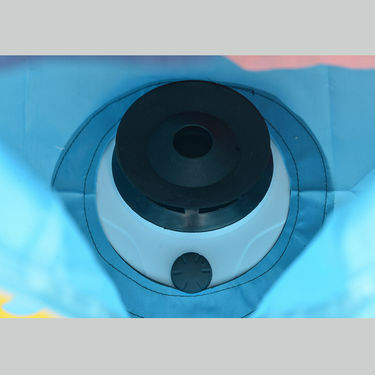 The whole machine is made of aluminum alloy thickened aluminum tube, load-bearing can reach 10-15KG, arbitrary drying. Two enlarged towel racks a total of 10 shelves, value configuration. More flexible use, more space, hanging more towels or children's clothing. 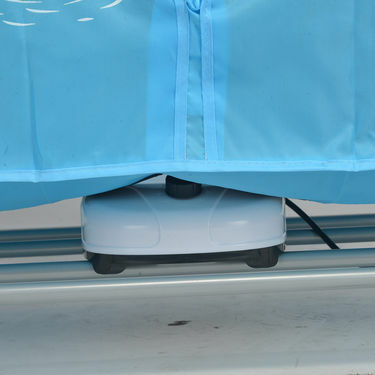 Patented design, dislocation-style hot air outlet, Can make the air flow after the rise, even reach every corner, to ensure uniform clothes can be dried. On the other hand, can also block the water droplets into the host to ensure that the host security.180 minutes, can be adjusted according to the needs of clothing. The most secure design, built in dual temperature control safety device to ensure your safety. Automatic fuse, External temperature or internal temperature of 105 degrees Celsius or more, automatically shut down the machine to protect personal safety. Intelligent temperature controller, Automatic monitoring of temperature changes, the temperature is higher than 85 degrees Celsius, the machine automatically shut down to wait for cooling before they can boot.CE approved and BS standard plugs. Drying time of up to 180 minutes, according to the following recommendations, drying their own clothing. You only need to wash your clothes, hanging on the shelf, you can hang up to 15kg heavy clothing, pull the zipper, press the start switch, you can start drying sterilization. Operation is very simple, the elderly children can operate. Dryer is not used for drum washing machine drying, dryer healthier, more professional, hanging vertical drying, drying clothes cannot wrinkle, can be used out, the equivalent of steam iron function . Dryer with four wheels, you can always move the location, can be used as wardrobe, wardrobe use. Cloth cover with a thicker version of the waterproof Oxford cloth, you can prevent dust do not interfere with clothes. We recommend that you do not put children, babies and adult clothes together on the drum washing machine in the drying, the proposed dehydration washing machine, the drying out in a separate drying machine disinfection. So that health with you, reduce the breeding of bacteria and infection. Kawachi Electric Cloth DryerVSSuperSonic Colourful Insect & Pes.. Kawachi Electric Cloth Dryer VS SuperSonic Colourful Insect & Pes..
Kawachi Electric Cloth DryerVSWellberg Electric Power Saver - B.. Kawachi Electric Cloth Dryer VS Wellberg Electric Power Saver - B..